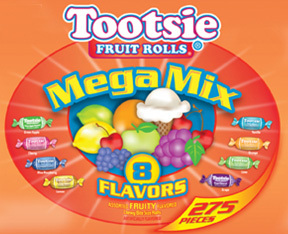 Chicago, IL - Tootsie Roll Industries delivers maximum fun with Tootsie Fruit Rolls 8-Flavor Mega Mix Bag that includes three fantastic NEW flavors! In addition to the favorite five original flavors of Vanilla, Cherry, Lemon, Lime and Orange, candy lovers will love the hot new flavors only available in this special release Mega Mix Bag! This product is Kosher as well as nut, egg and gluten-free.